NEW HAVEN, Conn. - The growing scrutiny of the rich dominated this year's best quotes, according to a Yale University librarian who anointed the Occupy Wall Street protesters' slogan  "We are the 99 percent"  as the year's best. Fred Shapiro, associate librarian at Yale Law School, has released his sixth annual list of the most notable quotations of the year. Shapiro noted that the conservative tea party movement was prominent in last year's quotes. "The tea party quotes are very strongly anti-government," Shapiro said. "The Occupy quotes and the other more liberal quotes that you see at the top of the list this year are directed more at Wall Street and the upper 1 percent economically of the country rather than focus squarely on government." The original "Yale Book of Quotations" was published in 2006. Since then, Shapiro has released an annual list of the top 10 quotes that would be incorporated into the next edition. Shapiro picks quotes that are famous, important or revealing of the spirit of the times, not necessarily ones that are the most eloquent or admirable. The "We are the 99 percent" slogan stems from a movement against economic disparity and perceived corporate greed. Protests began with the Occupy Wall Street encampment in Manhattan in September and have spread around the country. Billionaire investor Warren Buffett made the list for his complaint that rich people pay a smaller share of their income in federal taxes than middle-class taxpayers. His op-ed prompted President Obama to suggest that a minimum tax be imposed on millionaires. And Elizabeth Warren, a Democrat running for Senate in Massachusetts, made the list with her remarks that the rich didn't do it on their own. While the super-rich were in the crosshairs of this year's top quotes, bumbling politicians made their usual strong showing. Republican presidential candidate Rick Perry came in 5th with his "oops" comment at a debate last month. On the Democratic side, former U.S. Rep. Anthony Weiner of New York placed 9th with his "I can't say with certitude" when asked whether a lewd photograph was in fact of him. 1. 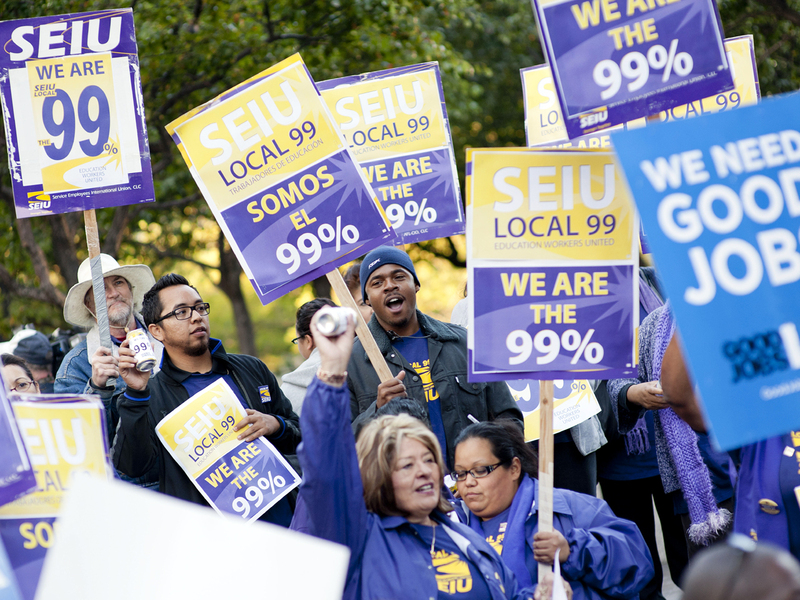 "We are the 99 percent."  slogan of Occupy movement. 2. "There is nobody in this country who got rich on his own. Nobody. You built a factory out there  good for you! But I want to be clear. You moved your goods to market on the roads the rest of us paid for. You hired workers the rest of us paid to educate. You were safe in your factory because of police forces and fire forces that the rest of us paid for."  U.S. Sen. candidate Elizabeth Warren, speaking in Andover, Mass., in August. 3. "My friends and I have been coddled long enough by a billionaire-friendly Congress."  Billionaire Warren Buffett, in a New York Times op-ed on Aug. 15. 4. "I believe in evolution and trust scientists on global warming. Call me crazy."  Presidential candidate Jon Huntsman in an Aug. 18 tweet. 5. "Oops."  Presidential candidate Rick Perry after unsuccessfully attempting to remember the third federal agency he would eliminate during a Nov. 9 debate. 6. "When they ask me, 'Who is the president of Ubeki-beki-beki-beki-stan-stan?' I'm going to say, 'You know, I don't know. Do you know?"'  Then-presidential candidate Herman Cain in an interview by Christian Broadcasting Network on Oct. 7. 7. "I am on a drug. It's called 'Charlie Sheen.' It's not available because if you try it once, you will die. Your face will melt off and your children will weep over your exploded body."  Actor Charlie Sheen in a February interview with ABC News. Sheen: "I'm on a drug. It's called Charlie Sheen"
8. "Oh wow. Oh wow. Oh wow."  Apple co-founder Steve Jobs' last words on Oct. 5, as reported by his sister Mona Simpson in her eulogy. 9. "I can't say with certitude."  Then-U.S. Rep. Anthony Weiner on June 1 when he was asked whether a lewd photograph was in fact him. 10. "Instead of receiving the help that she had hoped for, Mr. Cain instead decided to provide her with his idea of a stimulus package."  Lawyer Gloria Allred on Nov. 7 discussing Herman Cain's alleged sexual harassment of her client.